Seniors love to sing. They may not love listening to the Gospel. They may not show up in the common hall of their seniors' complex if your event is billed as a Gospel meeting. But if you advertise a good 'old-fashioned sing-song' - the room will fill up quickly. Could you classify it as Gospel Outreach? Why not? Some seniors' facilities will allow someone to speak a short message in the Gospel - but not all. Don't forget the independent and semi-independent living complexes for seniors. These people are still somewhat active and can get to the common room themselves. They can still read the words on your hymn sheet and they can still sing. They often enjoy seeing children - not to mention the adults. Many seniors are still somewhat familiar with some of the old hymns. They have heard them sung at church over the years, at funerals, etc. As a newer generation grows old, the 'future' seniors will not be as familiar with the hymns. But for the next five to ten years - you will still find many seniors who will know some of the hymns. Be sure to include in your hymn sheet, some hymns they will recognize like: Jesus Loves Me, Amazing Grace, Rock of Ages, The Lord's My Shepherd, The Old Rugged Cross, etc. If you are a young person reading this, make sure you consult with some older believers to see what hymns seniors might like. Make sure the font is large enough for the majority of seniors to read with ease. 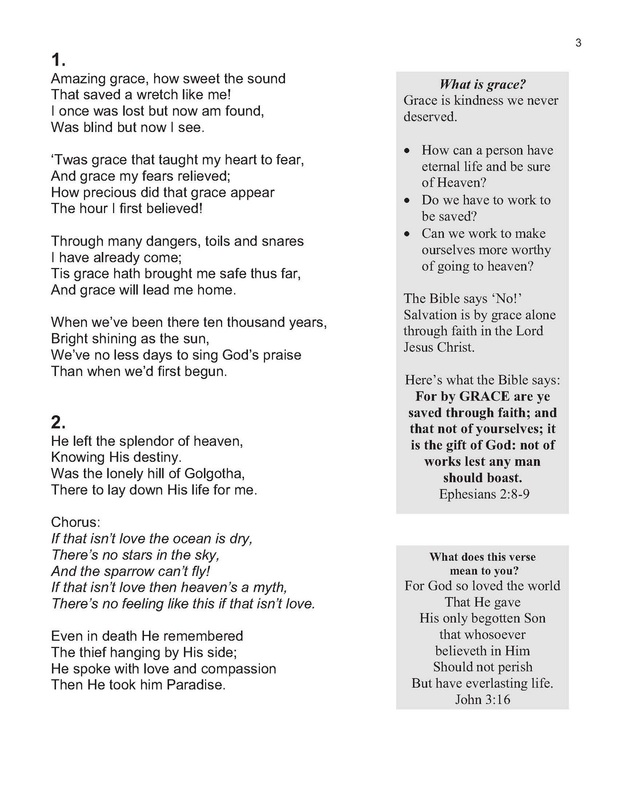 You may want to have the hymns on one side of the page with a sidebar to emphasize some Gospel truths about the hymn. This is particularly relevant if you don't have the opportunity to share the Gospel. The seniors will at least see the hymns and some Gospel notes and pertinent questions beside most of the hymns. As the hymns are sung, they may do some thinking. Here is one such page from our seniors song sheet. You will quickly see the idea. If any of the seniors want to keep their hymn sheet, let them. They could trust Christ back in their suite reading the hymn sheet. For a few cents you can print some more off! If you would like me to send you our WORD file for the Seniors' Songs just email me by clicking here. 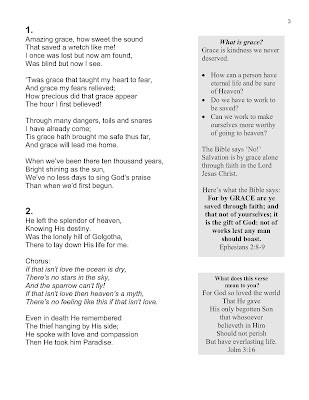 In the subject line just put: Seniors Hymn Sheet. That's all you need to say and I will gladly forward our simple one to you. You can then edit and add to it as you see fit. It's not a published document so credits and sources are not cited. That could be a next step. Many of these seniors are one step or a few breaths away from eternity and most are not prepared. They so often appreciate people coming to visit them - especially if it provides a form of entertainment. You don't have to be professional singers. Find a guitar player or a piano player and 10-20 voices and sing them the Gospel. It is an activity of eternal significance.